Copyright © Stephan Wolfsried 4/2017 - This image is copyrighted. Unauthorized reproduction prohibited. Sony Alpha 7R ii, bellows, Mitutoyo M Plan 10x, aperture, Raynox DCR-250 retro, Stack-Master linear actor, stack shot control. 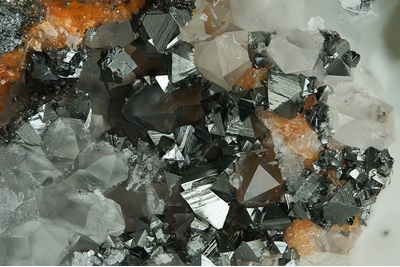 Metallic black octahedron-like crystals of manganoquadratite with colourless quartz. Collection and photo Stephan Wolfsried.